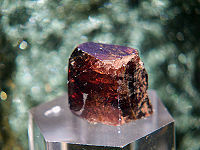 Zircon is a mineral belonging to the group of nesosilicates. Its chemical name is zirconium silicate and its corresponding chemical formula is ZrSiO4. It must not to be confused with zirconia the diamond simulant. Jacinth, a kind of red zircon, is among the "foundation stones" of Jerusalem's city walls in Revelations (Revelation 21:19-20 ). Some have supposed that this stone was one of the stones placed in the breastplate of Aaron in the 3rd row (Exodus 28:15-21 ). According to Jewish legend, the angel sent to the Garden of Eden to watch over Adam and Eve was named Zircon. ↑ "Gemopedia - zircon". 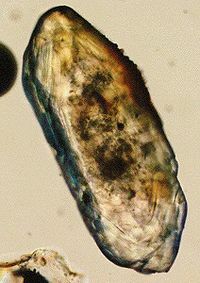 http://www.jtv.com/library/zircon-gemopedia,default,pg.html. Retrieved 03-27-2013. This page was last modified on 27 March 2013, at 12:59.